Another bonus, Jetta also delivers excellent fuel economy. I got 28.6 miles per gallon in about 60% city driving. The EPA rates the car at 23 mpg city and 33 mpg highway. But let’s start with Jetta’s quickness. 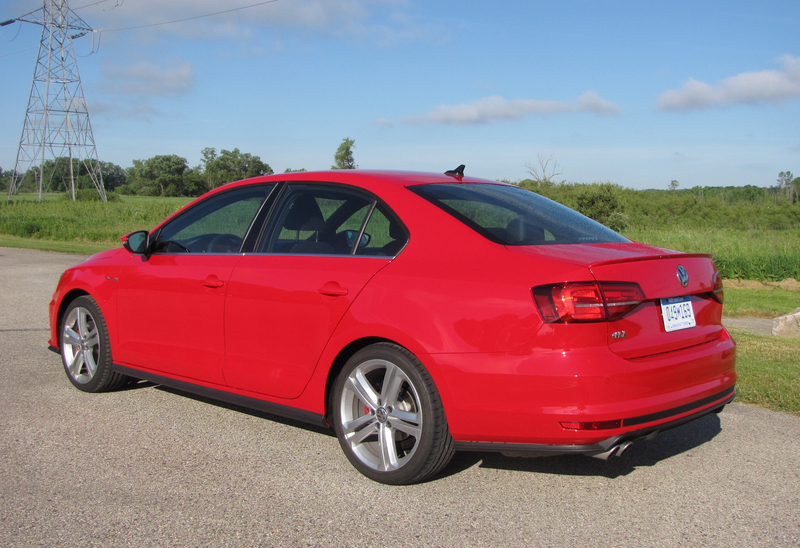 I drove a “Tornado Red” GLI SE model, about midway up the Jetta food chain. 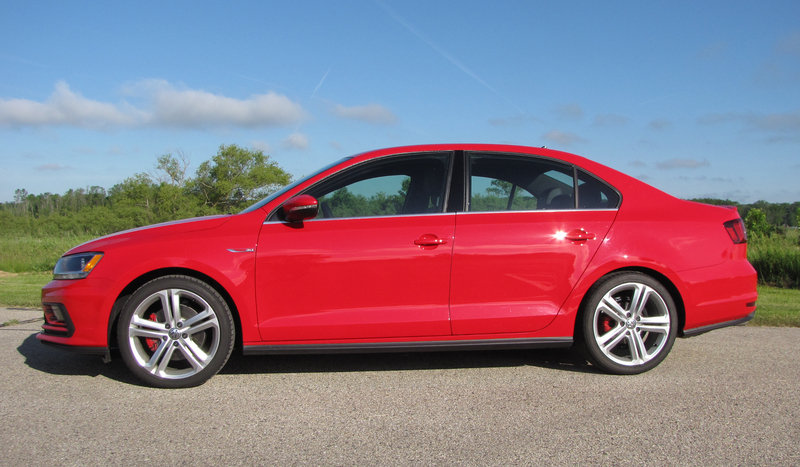 This features a 2.0-liter TSI turbo I4 that pumps out a generous 210 horsepower. In a car that weighs just 3,131 lbs., that creates a perky spurt away from any stoplight and a powerful gallop down any highway entry ramp. Since you control your revs with the 6-speed manual, you can choose to save fuel by moderate acceleration and quick gear shifts, or wind it up by holding each gear longer and feeling the power surge beneath you. Either way, the shifts are smooth and clutch pressure moderate. Steering is light and responsive and the car, despite looking much like a retro boxy sedan, corners well with no lean or push. 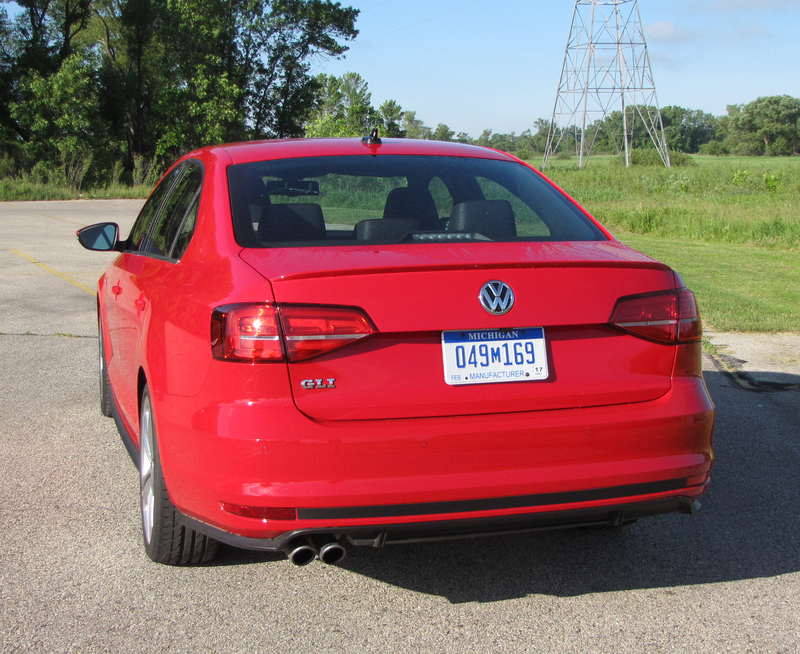 Balance is nice for the front-drive Jetta and I rarely chirped the tires unless I got overly aggressive. Grip was also aided by its 18-inch Bridgestone summer performance tires. A four-wheel independent sport suspension provides a firm, well-controlled ride, but it was less stiff than I expected. That’s good. The wheelbase is 104.4 inches, just a smidge less than the 106 that I consider optimum for pleasant ride quality. But Jetta is so easy to drive that a person who enjoys the driving aspect will easily tolerate its somewhat firmer ride. Braking was excellent and I did have one somewhat sudden stop in a brief highway drive when drivers suddenly got on their brakes for a zipper merge, even though it was well marked. I like the new Jetta’s smoother lines, but really appreciate its handsome, youthful interior. Certainly it’s heavy on black VW leatherette seating and includes a black soft textured dash. But the use of black gloss trim on the dash, around the center stack’s face and the red trim line on the doors and dash really create a fashionable flair. That’s augmented by chrome trim around vents, steering wheel hub, buttons and other controls. The dash is clean and fits the car’s no-nonsense personality of providing a pure, easy driving experience. Fit and finish are flawless and while everything is simple the feeling is of a higher cost vehicle. Gauges are simple and easy to see and the main nav/radio screen is on the small side, but functions well and is easy to understand. There are two small knobs for volume and tuning the radio and three large knobs for the dual climate control system below. Check out the red trim line on the dash and stitching on the wheel. Cruise control and radio volume are on the steering wheel hub, as are trip computer controls. The wheel is a manual tilt/telescope model with a flat-bottom wheel. That’s racy and increases driver knee room. Other features inside include power mirrors, automatic lights and push-button start. VW continues its habit of creating comfortable, supportive seats up front. These give particularly good back support and there’s a manual lever to increase lumbar support. The front seats also include three-level heating. Other pluses include a Fender sound system, Bluetooth connectivity and VW’s Car-Net with App-Connect to allow your smart phone to link up easily. The car also comes with park distance control, a rearview camera and cooled glove box. Side mirrors are heated and foldable, plus there are front fog lights and rain-sensing wipers. The rear seats split and fold and there’s a pass-through if you are packing skis or long lumber. The trunk itself measures 15.7 cubic feet, much more than most compact sedans. While large it doesn’t cut dramatically into rear seat room. Four adults fit comfortably. Flat-bottomed wheel is racy and frees up knee space when entering and exiting the car. There’s also a sunroof overhead and visors that slide. Bingo. Finally, the best news – price. 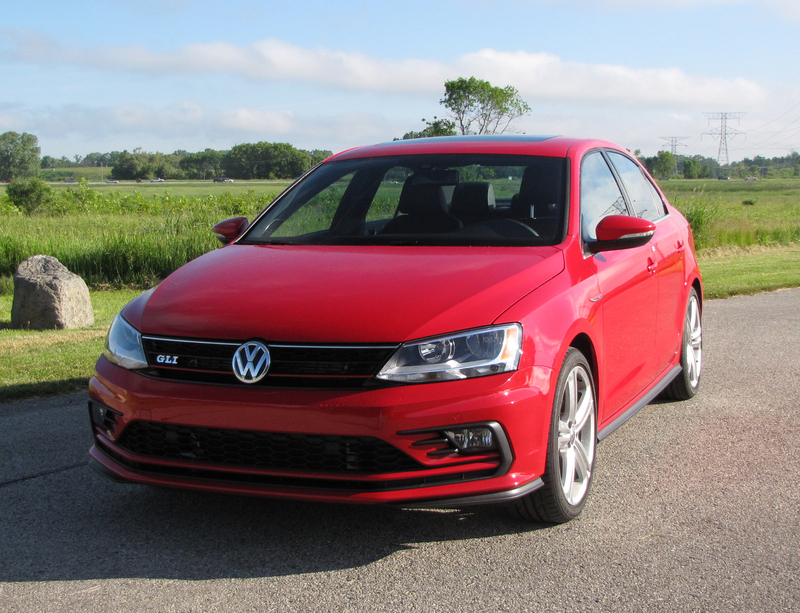 A base Jetta with a 1.4-liter, 150-horse I4 lists at $18,500 and comes with a five-speed manual. Moving up to a 1.8-liter I4 with 170 horses and the same five-speed boosts entry to $21,715. Jetta’s delivery fee is $820. 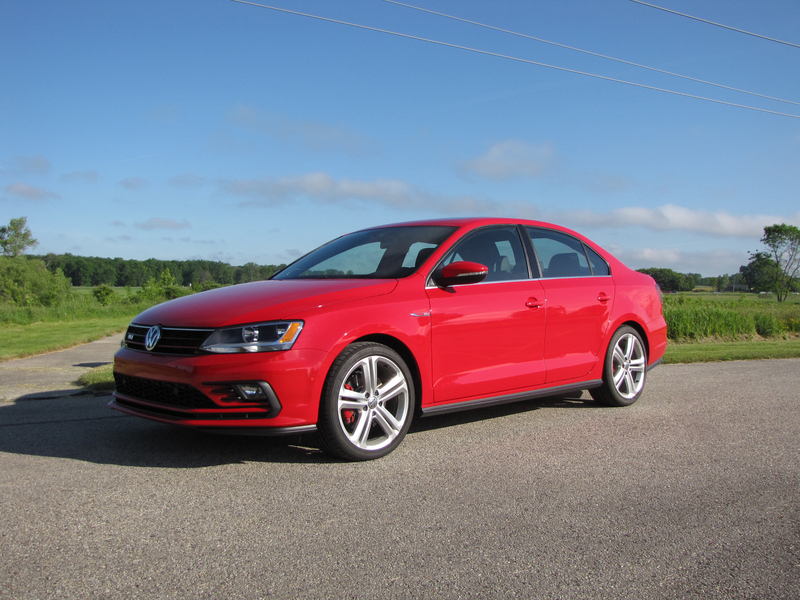 The tested 2.0T GLI SE lists at $26,920 and with delivery moves to $27,740. There were no options on the test car and at this price it is nearly $7 grand shy of the average new car price. That alone can put a little more fun into driving. For the record there’s a hybrid model that starts at $31,940 with an automatic transmission and there has been a diesel option, but that’s on hold as VW works its way out of legal troubles for fudging diesel emission results. That’s for the attorneys and U.S. regulators to work out. For now the turbo-powered Jetta is one of the most enjoyable driving machines I’ve experienced, and at a bargain price. Jetta deserves a serious look! Hits: Quick, lively handling with a good 6-speed manual. Refreshed exterior styling and handsome youthful interior with clean dash, comfortable supportive seats, Fender speakers, heated seats, flat bottomed wheel. Large trunk and good fuel economy. Glad you like it and thanks for stopping by.